Open Box - This item is ex-demo and as new with full warranty. 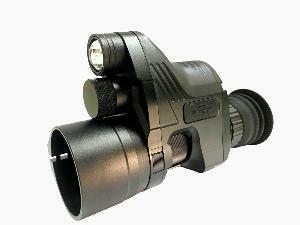 The PARD NV007 is a new evolution of digital add on devices for day optics. At the heart of the unit is a full 1080P HD day / night sensor. This HD image is then relayed to the high resolution wide field of view 800x600 eyepiece display. The unit can be used off of the rifle for spotting, day or night, with a useful optical magnification of 2-7x and built in IR means it’s completely self contained, even at night. Fitting to the rifle to use as an add on is accomplished by a very quick bayonet QR attachment (one supplied with the unit). Very similar to changing a lens on a camera. We have updated the design on the bayonet to accommodate day scopes up to an eyepiece diameter of 47mm and even those with illuminated reticule turrets. Mention your brand and model of scope in the comments section of your order and if a custom shim is available, this will be supplied for a perfect fit, free of charge. Additional QR clamp bayonets are available for easy use of the NV007 on several rifles. 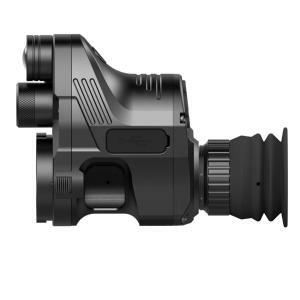 The unit is very short and close couples to the rifle scope so you can view and record your shooting, day or night in full HD at the touch of a button. The recorded videos and still photographs are saved to a micro SD card (not supplied). Recorded videos can be instantly reviewed directly through the device, for ‘shot review’. The unit is powered by a single 18650 flat top rechargeable battery (supplied) and can be charged externally or inside the unit itself via USB. The unit can also be powered via USB. Battery life is around 8 hours. The unit also has built in WiFi transmission so the view can be monitored on a smart phone or tablet. The app can also be used to control the recording functions of the unit. Night time range fitted behind a day scope at a system magnification of 10x is 200 yards+ with the built in IR, 300 yards+ with a Black Sun Ruby BR20 and 400 yards+ with Black Sunnranger Ruby. If you utilise the digital magnification then these ranges can be achieved at even 20x system magnification with no loss of detail on the 800x600 display! The unit has a fast 5 second start up and also has a sleep function for ‘instant on’. 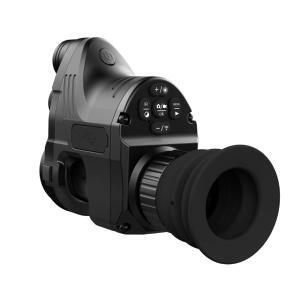 The unit works best, especially at night with a day scope that has either adjustable objective or side parallax, that will ideally focus down to 40 yards due to the different focal point of IR light. Maximum eyepiece diameter of your day scope should be 47mm or less. Well worth it for the money.